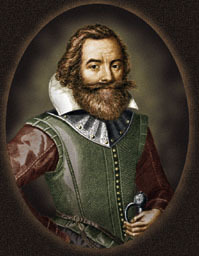 The important thing about Captain John Smith is that he helped communicate and make peace with the natives for the second English colony sent to Virginia. This colony was the first to survive all the hard winters, the food shortages and natives. In Jamestown(the town they built) at one point of their lives the people/hunters couldn’t hunt because the natives would pick them off one by one so they couldn’t get food and some people starved to death. Also that was bad because sickness soon came upon the people and more than 100 people died from it. Also if Captain John Smith never came to Jamestown, the natives would have killed everyone and no one would have survived.Everyone would have probably ended up like the Roanoke Colony. When Captain John Smith was in Jamestown he worked really hard to make houses and to hunt. This hard work was paid off in 1608 when Smith became the third president of Jamestown. Even though Smith only ruled for about a year, he was known to be the best president of Jamestown. But the important thing about Captain John Smith, is that he helped communicate and make peace with the natives for the second English colony sent to Virginia. Doak, Robins S. John Smith and the Settlement of Jamestown.2003. Barbour Philip L.”Smith, John.” U.S. and World Biography Online. Lincoln Library Press, 2017. FactCite, www.factcite.com/useh/3016622.html. “Smith, John.” World Book Kids, World Book, 2017,http://www.worldbookonline.com/kids/home#article/ar831321 . Accessed 16 Nov. 2017.